Went back to the chaos with my friend Cindy, she’s the one who told me about this pop-up cafe weeks ago. Thank goodness she had a “mental health day” and arrived early. 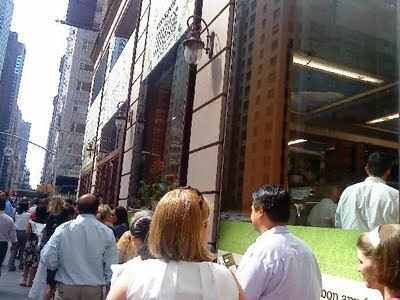 While I waited outside for 20 mins (even though I arrived 11:50), she was inside battling the lines and crowd to get our food. Special of the day Cat Cora’s Skirt Steak Tacos with Shiitake Mushroom Salsa. I’m no taco expert, but can this be called a taco? looked more like a cigar roll or a anorexic fajita to me. Sure the skirt was well marinated (good mix of garlic, honey, citrus and pepper), tender and juicy but did I mention this was $9? or $1 per bite! I did like the flavors, specially the shiitake mushrooms that had a heavy handed sesame with chipotle, sesame seeds and fresh cilantro, but a bit overpriced don’t you think? 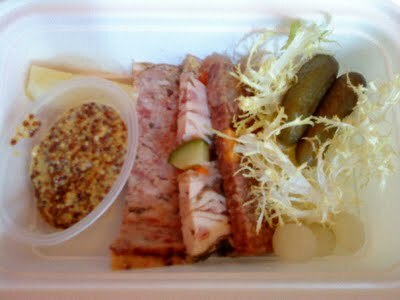 Daniel Boulud’s Signature Terrine Trio wasn’t as amazing as I anticipated, actually it was just average, nothing really stood out, we didn’t finish it. 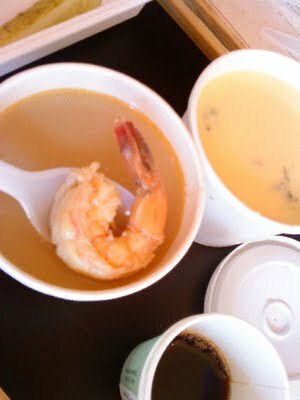 This was the worst thing I tasted in the cafe, Bon Appetit’s Spicy Thai Coconut Soup with Gulf Shrimp, I didn’t know what to make of it. Not much coconut flavor, mostly just spicy and sour, but also very very shrimpy, in the worst way possible. Tasted like a pot of shrimp shells in hot water. 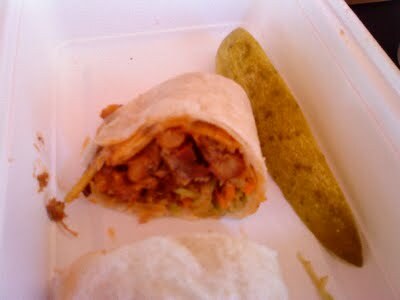 Best thing I tasted today, was Cat Cora’s CCQ Brisket Wrap, oh yeah! this is what brisket should be, juicy, extra tender and full of flavor from the spicy rub. It had a mix of garbanzo beans, and slaw. Sweet, spicy and tangy, full of crunch from the veggies, the very fine strips of celery was a perfect addition. All this awesomeness for only $8, what a great deal. It’s better than the briskets I had at the BBQ block Party held in Madison Square Park. I never really cared for Cat Cora on Iron Chef, but after tasting her food, I see why she has a spot. 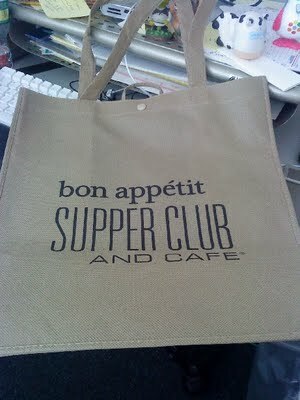 The Cafe came and is going away after tomorrow, but I’ll have this bag to remember all the yummy dishes. As promised on my Tuesday’s post, I ordered the Yuzu Tart once again and I loved every bite, so so good, the lingering citrus note is so pleasant. WD-50, here I come! We’re planning to go sometime in Oct, will keep you posted. Tomorrow is the last day, so if you’re in the area, check it out.